Italy has an extensive system of toll roads that cover the mainland from north to south and west coast to east coast and on the island of Sicily called the autostrada. The autostrada is designed for traveling more quickly than on the superstrada (non-toll highway). Autostrada highways are designated with an A in front of a number (such as A1, the major autostrada that connects Milan and Rome) and signs pointing toward the autostrada are green (shown in the photo). 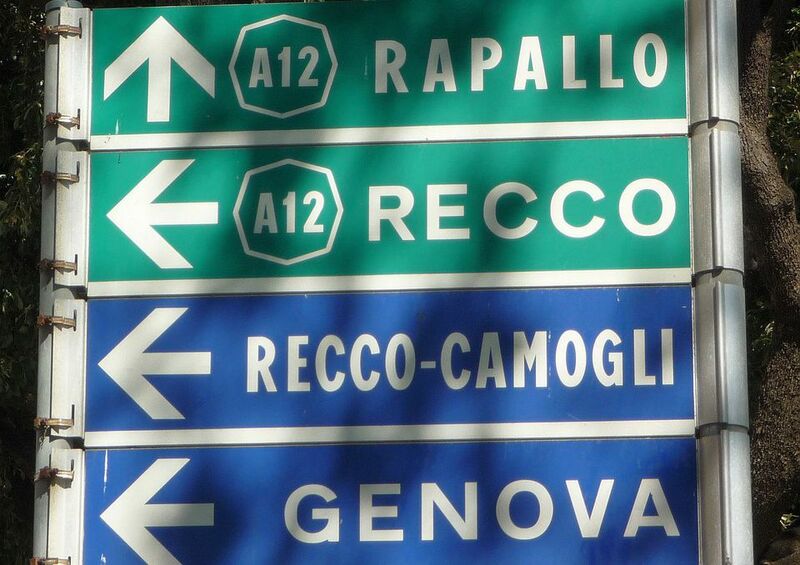 To enter the autostrada, take a ticket at the entrance gate, then follow the sign in the direction you want to go (usually indicated by a major city so you'll need to know what city you are heading toward). You will pay at a toll booth when you get off although, in a few places, tolls are collected periodically at booths along the autostrada. US credit cards do not always work at the toll booth so be sure you have cash with you. When you get to the toll booths, select the lane with a sign showing a hand and money. The maximum speed limit on any autostrada is 130 kilometers per hour but on some parts (such as between Viareggio and Lucca and in Liguria) the maximum speed is 110 so always watch for posted speed limit signs. On curvy stretches, the speed limit can slow to as low as 60 kilometers per hour and speed limits are also lower in construction zones. Again, watch for signs. Speeders are caught by Autovelox (cameras) or the Tutor System. Always drive in the right-hand lane, except to pass. On some stretches of the autostrada, there are three or four lanes and on those, you can drive in the lane next to the right (mainly used by trucks). The left lane is used for passing. If you're trying to decide whether to drive or travel by train in Italy, you'll need to add the cost of tolls to your price comparison. You can use an Autostrada toll calculator to find the cost of traveling between two points. There's also a calendar at the bottom of the page that shows dates for possible heavy traffic and a box next to it that lists the current cheapest fuel prices at northern Italy autostrada stations (note that prices are per liter and one liter is about .26 gallon). Along the autostrada are rest stops with gas stations, restrooms (usually clean and stocked with toilet paper), and places to eat or have a coffee along the highway. The Autogrill is the most popular place to eat where you'll find sandwiches, pastries, and snacks and sometimes a self-service restaurant open only during lunch and dinner hours. Part of the Autogrill is also a store and the larger ones often have good bargains on things like dry pasta, bottles of wine, or olive oil. Although Autogrill is considered to be the best, other restaurant or snack bars found along the Autostrada include Ciao Ristorante, Fini, and Sarni.